"Oh my God, I've married a nutter" said my wife as I diverted the car towards Farrar Road, home to Welsh Champions, Bangor City FC. It seemed like the most natural thing in the world to have a cheeky look around, even though, granted, it was 24 hours before the match - which was being played.......35 miles away. In Rhyl. We were in North Wales for a weeks holiday. A chance to unwind in the glorious countryside; to soak up that magnificent and varied scenery by day, before popping on my Real Betis slippers ('tour treasures' from a recent EFW), and fully recharge the AA Alkaline's by night. Pah! Who am I kidding? A few weeks prior to this trip, I had dispatched a warms set of balls to UEFA for them to use in their forthcoming Champions League qualifying draw. Incidentally, these are the same set used by the Scottish FA to keep Rangers and Celtic apart in cup draws. I sat and watched the draw unfold, mopping my brow as the men in suits pulled out.....a home tie for Bangor City, the nearest team to my little holiday cottage in Pont-y-pant. A success. My wife for one couldn't have rolled her eyes any further into her sockets as I broke the tremendous news. 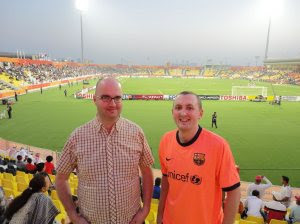 We were off to our first ever Champions League game, together. Who said romance is dead? I did a little dance before sliding across the kitchen floor on my knees. I'm 39. The game had been moved to the Belle Vue - home to The Citizens arch rivals Rhyl - because Bangor's current stadium doesn't have enough seats to cope with demand for a match of this magnitude. I've always dreamed of working for UEFA in the role of grading stadiums, so, as part of my application form for that job, I did, as I say, pop in to have a nose around at their current set up. With it's excellent transport links - right next door to the station, no less - and for having bags full of character, I'd have given it 5 stars any day of the week. As I type, however, I've yet to receive a reply back from Nyon regarding my new job. Tsk. Farrar Road. Unfit for Champions League football according to UEFA suits. Not even a neat bit of paintwork and a yellow hose could make them change their minds. I've heard bits and bobs about this Champions League lark, and so to drink in every aspect of this magical occasion, we arrived in town six hours early. I'd been tipped off that the Bangor City 'Fan Zone' was already in full swing in the Vegas Bar near to Argos on Bodfor Street. But in an attempt to secure a few wife-pleasing-points in the calm before the storm, we opted first to go for a walk up the River Clwyd for a shag or two. It was great to see them spreading their wings as they dried off the water after a long flight. A pre-match shag along the River Clwyd. Recommended. The Champions League was just another notch on every conceivable type of entertainment you can enjoy in this popular holiday resort on the North Wales coast. It's got a fine sandy beach, an indoor (indoor!) Sun Centre, and if static caravans are your thing, then you've hit the bloody jackpot here in the Welsh equivalent of Las Vegas. Arriving at the ground we asked around for the clubhouse. "I don't work here" said one steward, "This is my first day" said another, shrugging his shoulders. And finally "They haven't got a bar mate, they're in the process of building one," said a friendly local bobby. So up the road we trooped to the local alehouse. Once we'd swung through the doors I immediately doffed my Stone Roses 'Reni' sunhat to the 20 or so HJK fans present. They'd flown into Manchester from Helsinki, hired a mini bus to take them to Wales, and were now sinking pints and bottles of wine at great speed. Overhead clapping to you chaps, you did your team proud. I) They normally goose up their European games against "weaker" opposition. II) Their holding midfielder, Alexander Ring (18), is one of the best talents in Finland at the moment. III) Striker Teemu Pukki (21), played well for the Sevilla B-team a couple of years ago and was another 'player to watch'. IV) HJK played in the Champions League group stages in the 1998-99 season. The only time a Finnish team has ever done so. V) I was under orders to abuse midfielder Aki Riihilahti who had previously become a legend among, spit, Crystal Palace fans. VI) What's this? Only the greatest Finnish player of all-time, Jari 'Litters' Litmanin plays for HJK. But these days, only when he feels like it. And this wasn't to be one of those days, sadly. Fully oiled refreshed after a pre-match with the Finns, we entered the ground past, Brian and his pal...Brian selling programmes, and made our way to the temporary Bangor City club shop. Yes of course replica shirts, yes, yes, souvenir Champions League T-shirts. But the third and only other item for sale on the night: boxer shorts (boxer shorts!). Not Bangor City boxers either. "It's the only time blokes ever go shopping for clothes" said my wife. A very good point well made. I purchased two pairs. Replica shirts? No thanks, boxers shorts all-round. The two teams took to the pitch in glorious sunshine. Sadly, not to the tune of the Champions League anthem. They didn't have official Champions League balls, either. UEFA had sent a new flag to fly over one of the stands, but evidently their budget doesn't stretch to a CD and a couple of Adidas footballs. Another letter has gone out in the post to Nyon. This won't do. UEFA had failed to send a shipment of CL balls, so we had to make do with the Macron, Super Brilliant 09. "Singing aye, aye, Bangor, Bangor, aye...." sang the "home" faithful. "Helsingin Jalkapalloklubi – Helsingfors Fotbollsklubb, clap, clap, clap clap clap clap...." retorted my new friends from Finland. The bulk of the Bangor fans even changed ends at half time. The Champions League eh? A competition I'd previously thought was on the bones of its arse, during the groups stages, anyway. And here I was, in my new pants, loving every minute. Bangor certainly didn't disgrace themselves, far from it. In fact they were the better team for large periods of the match, and pretty much dominated the second half. The visitors - seasoned European campaigners, and confidence oozing off the back of a ten match winning streak - had three shots, and scored three goals. Two of them came from the prolific former Leeds United man, Berat Sadik making it 17 goals in 19 games for him this season. (£3 on the match programme well spent there - Ed.). In true CL-style, HJK keeper Ville Wallen rolls around on the floor. The home faithful are unimpressed. Still, Bangor fans left Rhyl with their heads held high. Despite the scoreline the whole night had been a success. It's ludicrous that a crowd of this size should rattle around at Wrexham's Racecourse Ground, which was the alternative venue mooted for this match. Here, at Rhyl, it felt like an occasion. Closer to home for those vocal and passionate City fans as well. "Do you still think I'm a nutter?" I said to my wife after the match. "No, and furthermore, I thoroughly enjoyed it as well" she replied. Just as well, because I fancy going back to see Bangor City in their splendid Farrar Road ground next time. Young love eh? Bangor City: Unity is Strength. Further reading: EFW goes to Llanelli v Motherwell. And 'Should Welsh teams be banned from Europe' asks @ffwtbol. Follow European Football Weekends on Twitter and discuss this and more on the new EFW forum. With Danny half way up a mountain, the publishing tasks have been given to our office junior. So any diversion from our normal style is all down to him and he will be sacked on Danny's return. Mark Pitman reports from The Gnoll as Neath fall at their first European hurdle against Kjetil Rekdal's Aalesund FK. The famous Welsh rugby landmark of The Gnoll played host to European football for the first time as tenants Neath welcomed Norwegian outfit Aalesund FK to South Wales for this UEFA Europa League 1st qualifying round match. The visitors arrived with a comfortable 4-1 lead from the 1st leg and their progression into the next stage of the competition seemed nothing more than a likely formality against a Neath side competing in European competition for the first time in their short history. 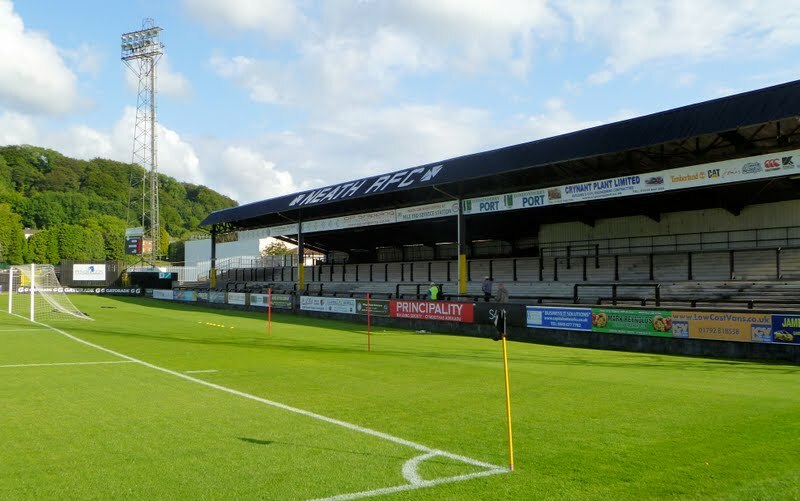 It would not prove to be a comfortable evening for the Norwegians and their manager Kjetil Rekdal however, and Neath are now left to focus on their preparations for the new Welsh Premier League season, wondering what might have been. With a comfortable lead from the match in Norway the week before, Aalesund named an experimental side but still filled with enough quality and experience not to leave the eventual outcome of the tie in doubt. That was at least the theory of manager Rekdal as the team bus pulled up outside The Gnoll early on Thursday evening and his players stepped onto the well-maintained playing surface in the bright South Wales sunshine. Joining the squad on their travels to South Wales were around fifty of the clubs 'Stormen' supporters club members who made themselves known to the local community and publicans in the build-up to the match. Neath manager Terry Boyle had watched his side pay the price of conceding two goals in three first-half minutes in Norway and made one change of his own as striker Craig Hughes replaced Chris Jones in a strength-over-speed choice. Neath would need to score at least three times without reply if they were to overturn the scoreline and another attacking line-up was preferred by Boyle and his backroom staff as the two sides began to warm-up on their respective sides of the pitch. With kick-off an hour away, supporters and curious neutrals made their why through the turnstiles, many immediately gaining a negative impression when they were informed that the club had already sold out of programmes an hour before the match would begin, having put less than a hundred on general sale. 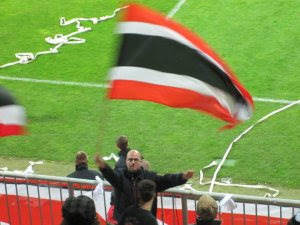 Although programmes were in short supply, commemorative scarves were readily available outside the ground as sellers lined all routes to the stadium. 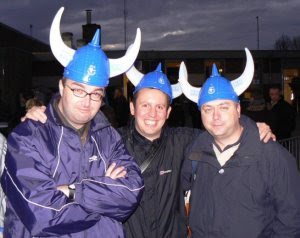 The merchandise proved as popular as lager with the visiting fans as the Norwegians invested in a souvenir of their short time in South Wales. Neath's high-profile striker Lee Trundle had called on the supporters of his former club and now neighbouring Premier League side Swansea City to come out and support him and his new team in Europe and a healthy crowd had arrived at The Gnoll as Belgian referee Christof Dierick lead the two sides out to some polite hand-clapping. Photographers gathered around for the respective team photo's as Boyle and Rekdal took their places in the dugouts. The dozens of travelling fans had begrudgingly staggered from the clubhouse around to the stand on the cricket ground side of the stadium and began the first of many chants and choreographed moves that would eventually prove more entertaining than long periods of the game. In the main stand Crystal Palace assistant and former Cardiff City manager Lennie Lawrence was the most recognisable face in a sea of Welsh football who's-who as captains Lee Trundle and Peter Orry Larson met in the middle of the field in their respective number ten shirts ahead of kick-off. For most people inside the ground, Neath were simply playing for pride against their superior opponents, and emerging from the tie with their pride intact would realistically be the best possible outcome for the Eagles. Aalesund forced the early possession with the influential Michael Barrantes orchestrating the midfield and offering a regular supply line to Jamaican International and former Stoke City midfielder Demar Phillips. The final ball proved poor for the Norwegian side however and Neath quickly grew in confidence as their talisman Lee Trundle became more and more involved in his sides build-up play. Trundle made his career in the Football League as a showman with an library of tricks at his disposal. Now playing behind lone-striker Luke Bowen, he became the target of all of goalkeeper Lee Kendall's kicks, and caused a series of problems for the Aalesund defence as he tricked and flicked his towards goal while linking up with Bowen and midfielder Paul Fowler to create a number of openings for his side. In the build-up to the 1st leg, Aalesund had dismissed the possible impact of Trundle, but he answered his critics in Norway with the opening goal. Now quickly becoming the star of the 2nd leg, Aalesund became rightly concerned over his influence and resorted to conceding free-kicks inside their own half in a cynical approach to calming his impact on the game. With the opening half reaching the midway stage, Neath had settled into the game and were matching their opponents in all areas of the park. Aalesund had forced free-kicks and corners of their own but, like their crosses and final-balls before, they could only waste the set-piece opportunities that were presented to them. Neath sensed the complacency in their opponents play and striker Luke Bowen twice came close to handing his side the lead with both a header and a superb run that saw the recent Neath signing weave his way past two Aalesund defenders before curling his effort narrowly wide of the far post. A penalty appeal followed as Bowen appeared to be brushed aside inside the area and the tension in the Aalesund ranks became common knowledge through the animated antics and verbals of Kjetil Rekdal. Another free-kick on the edge of the area for Lee Trundle brought a save from Jonas Sandqvist in the Aalesund goal but he could only parry the ball into the path of Craig Hughes to present the striker with a golden opportunity. Under-pressure from back-tracking defenders however, Hughes failed to find the target, and Neath began to realise how many chances they had wasted and how few more they were likely to create. At the other end, Lee Kendall made a fine save of his own when he stopped a well-struck effort from Jonathan Parr before the break to keep the score level as referee Dierick signalled for half-time. Both sides left the field frustrated, Neath from having missed enough chances to have reduced the deficit from the 1st leg and Aalesund from having allowed Neath to create enough chances to have reduced the deficit from the 1st leg. As Katy Perry and Lady Gaga shook the speakers from the main stand roof, a mini-football match featuring two local junior teams provided further entertainment for those in the crowd without a programme to read. The low sun of the first-half was then replaced by torrential rain as the junior players quickly lost their enthusiasm and the two teams re-emerged from the changing rooms to a dark night of heavy drizzle for the second-half. 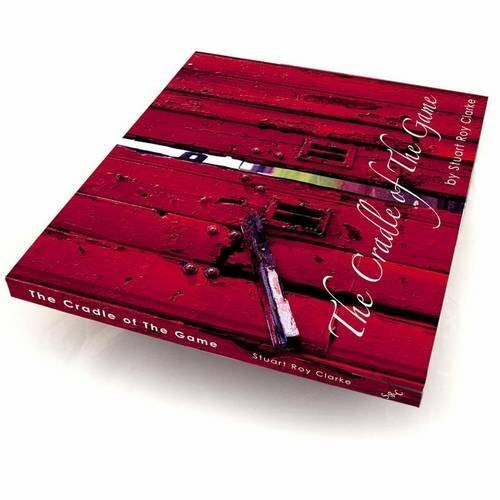 If the Neath team-talk had been to keep playing the way they were playing, the discussion in the away room would have been the opposite. Neither side decided on making any changes before the second period and after a slow opening few minutes the sun returned to dry out the playing surface. The competitiveness of the tie turned on 53 minutes however when Michael Barrantes, competing with Trundle for the man of the match award, drilled a low shot from the edge of the area that zipped past Lee Kendall on the wet surface and into the far corner of the net. The crucial away goal meant that Neath would now have to score four just to have a chance of taking the game to extra-time, and as they ball shook the net, the home side immediately conceded defeat. Minutes before the goal Luke Bowen had seen his long-range effort edge the wrong side of the post and his frustrations soon became apparent as he was booked for a late challenge a minute after the re-start. Manager Terry Boyle then decided to bring something different to Neath's game with the introduction of diminutive striker Kerry Morgan in place of Craig Hughes. Morgan proved to be a lively addition to the game and he wasted little time in becoming involved in his sides attacking play. His arrival proved constructive and another addition of pace was made as Chris Jones replaced Paul Fowler. Neath had to score quickly to have any chance of turning the tie around but as Trundle's influence became less apparent, so did Neath. 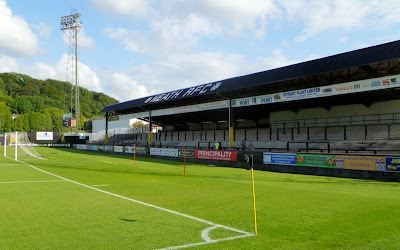 As the second-half wore on Neath's opportunities became less and less, while at the other end Aalesund continued to prove hugely frustrating to Kjetil Rekdal as his frantic actions continued on the touchline and he began to take on the look of a manager willing to put his entire squad on the transfer list the next morning. The tie was then taken out of Neath's reach on 79 minutes when Magnus Sylling Olsen scored the second goal of the game for Aalesund and the two sides played out the remaining ten minutes with little point or purpose. All the energy in the stadium was now being used solely by the travelling fans on the far side of the ground as they sang their side into the next round of the competition. Although not outclassed by any means on the night, Neath's European debut offered a steep learning curve into what they can expect on the biggest stage. A 6-1 aggregate reverse will be hard to accept from the chances they created in the opening-half but their failure to take advantage of what was presented to them proved to be the difference between the two sides. Aalesund now return to domestic action, currently being in the middle of their domestic season, while Neath will take a few days off from their new full-time schedule before beginning their pre-season campaign. Neath have invested heavily to qualify for European competition but the only justification for their substantial spend will be in making European progress. A little more composure on the night could have made all the difference as the Eagles would have been good value for at least a two-goal lead at the break and such a scoreline would have seriously shocked their opponents and their travelling fans. By comparison, Aalesund will be pleased with what appears a very comfortable double-victory, and they can now turn their attentions to Hungarian giants Ferencvaros who await them in the second round. Mark writes about all good things Welsh here and can be found on Twitter here. Following my trip to Plzeň the previous Saturday, my itinerary took me to the Czech Republic’s third city, Ostrava, where I was to attend the real ‘big match’ of the weekend, FC Baník Ostrava v. AC Sparta Prague. Ostrava is a city I know very well, having spent a year studying there in 2002-03. 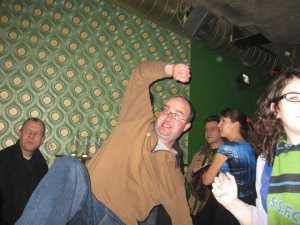 For this reason Baník remains my favourite Czech club, albeit not the first one I ever went to (that honour goes to Brno). Following the discovery of rich deposits of coal and other minerals in the region in the 18th century, Ostrava (located 350 km from Prague, in the north-eastern corner of the country) became one of the major centres of heavy industry in, successively, the Austro-Hungarian Empire and Czechoslovakia. Unfortunately, this industry went into sharp decline in the 1990s following the collapse of Communism, and the region still suffers from high unemployment. However, the cityscape is still dominated by two massive steelworks (one of which, currently owned by Arcelor-Mittal, is still operational) and a number of disused mining towers dotted around the city. Ostrava’s major (and now, following the bankruptcy of FC Vítkovice in the winter, only) professional football team is FC Baník Ostrava, originally founded as SK Slezská in 1922 in the Silesian part of the city. The club enjoyed its best years in the 70s and 80s, culminating in three league titles, won between 1975 and 1981 (adding a fourth in 2004-05). Famous names associated with the club include Luděk Mikloško, Pavel Srníček, Tomáš Galásek, Marek Jankulovski, Milan Baroš, Libor Sionko, Marek Heinz and Václav Švěrkoš. With FC Vítkovice existing for decades in Baník’s shadow, a true city rivalry never developed and Baník’s main grudge match is now against Sparta, and to a lesser extent Slavia, as well as Sigma Olomouc and Brno. Games against these clubs regularly draw the largest crowds, with Baník taking anything from 1,000-2,000 away fans with them. So I made my way eastwards – not, it has to be said, in expectation of a great spectacle, or even a home win. Having challenged for the title virtually up until the last day in 2009-10, Baník have recently been, frankly, crap, to the extent that they finished season 2010-11 only one place above (albeit six points clear of) the relegation zone. Still, it was Baník and, having missed out on the Sparta match last year due to not being able to get a ticket, I was quite keen to attend this one. Sadly, it all turned out as expected. Sparta won 2-0 thanks to two goals from their Cameroonian striker, Leonard Kweukwe. Baník were rather uninspiring and Sparta did what they had to do. The official attendance was a disappointing 8,133 (capacity: 17,372). As usual, the police were out in force for what was a ‘high-risk’ game. In the end, only a hundred or so Sparta fans turned up, which didn’t stop a police helicopter buzzing overhead for the entire duration of the game.